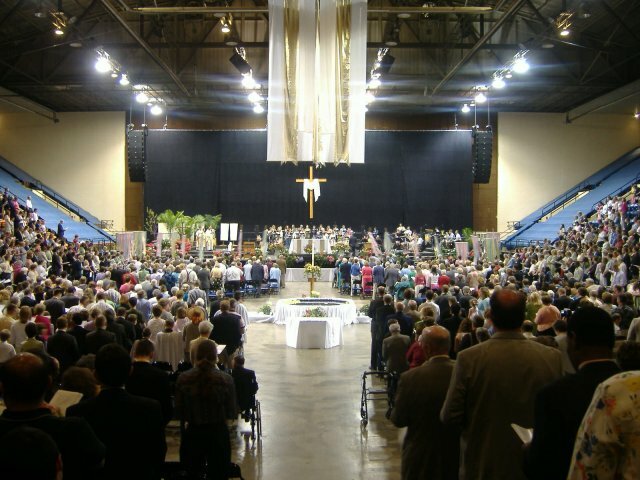 Easter Sunday mass at the Salem Civic Center. One Body around One Table! The Cross of the Resurrection becomes our primary focus. 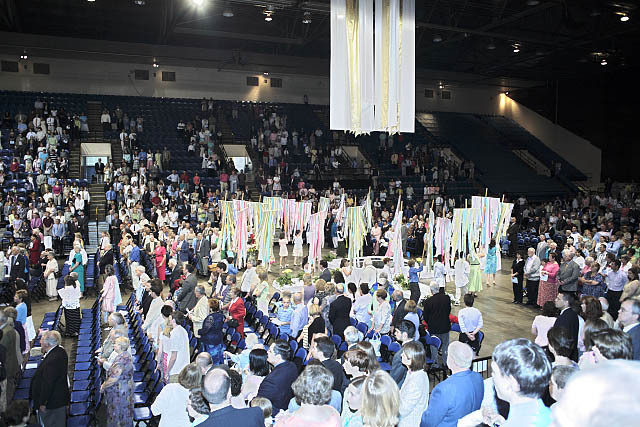 Our Neophytes gather around the font in their baptismal garments and add water blessed from the Easter Vigil service. Pictured are Jackie, Josh, Roy, Cody, Bridget and Elizabeth. 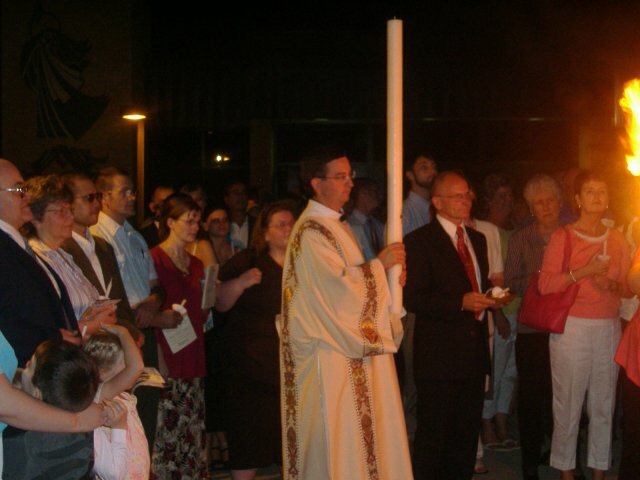 Deacon Mike carries the Paschal Candle and proclaims, "Christ Our Light" We proclaim: "Thanks Be To God"
We welcome Elizabeth and Bridget, baptized at the Easter Vigil! 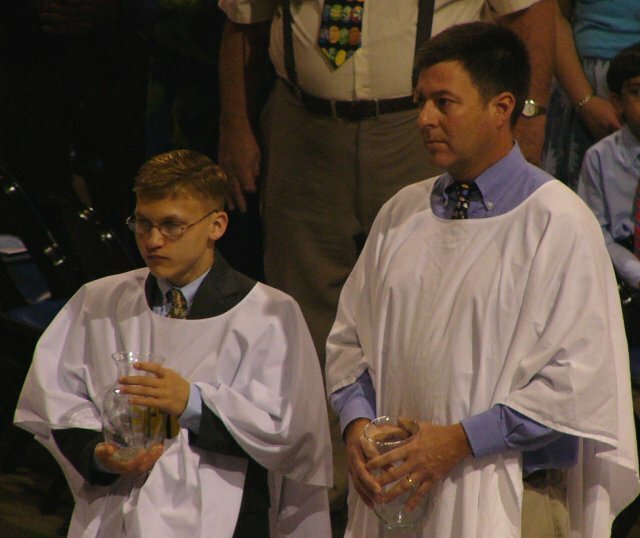 We welcome Cody and Roy, baptized at the Easter Vigil! Newly baptized Jackie with her sponsor Teresa after the Easter Vigil wearing big smiles on their faces! Our young banner carriers stand at the ready for our procession. "This is the Feast of Victory for Our God! Alleluia, alleluia, alleluia!" Deacon Mike proclaims the Gospel or our Lord. Ted and Nora lead behind the Cross the offertory procession. Our Liturgical dancers share their gifts as they dance with joy! The children's choir sings during the prelude. 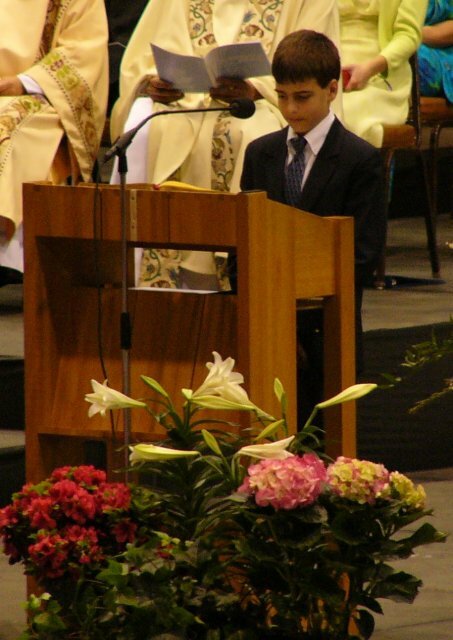 Ryan accompany's the children's choir. Look out Dan, here comes your replacement! Fr. Joe prays over the gifts. Fr. Joe sings the Eucharistic prayer. We remember and We believe! John proclaims the Word of God to the faithful. Gretchen shares her unique talents of signing with the assembly. Jan and Robin sing praise to our God for the beauty of all creation! Ed and the choir sing, "We Will Want No More", a musical vision of our life in heaven. 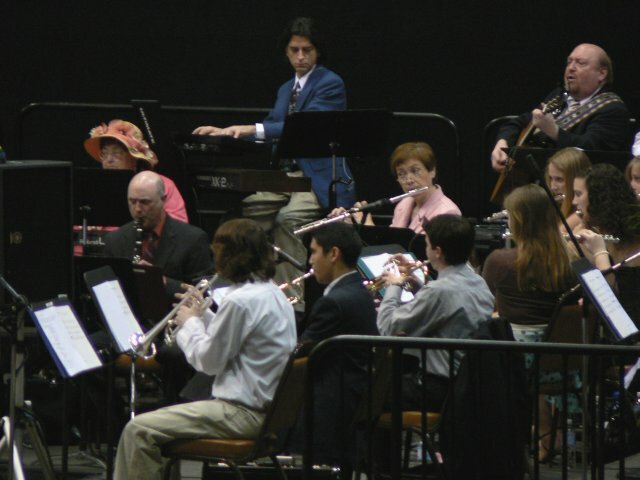 Musicians add so much to our Easter celebration! Thank You! Kim and Steve proclaim Psalm 118,"This is the day the Lord has made. Let us rejoice and be glad!" Dan conducts the choir and instrumentalists. A hard working adult choir sings praise to God! 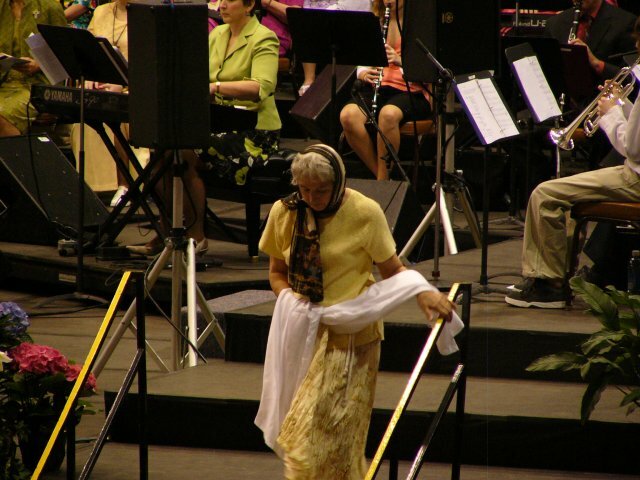 Donna interprets through liturgical movement the Easter Sequence. Muriel plays the bells during the Gloria! Guitars and Bass add to the musical rhythm of the day. 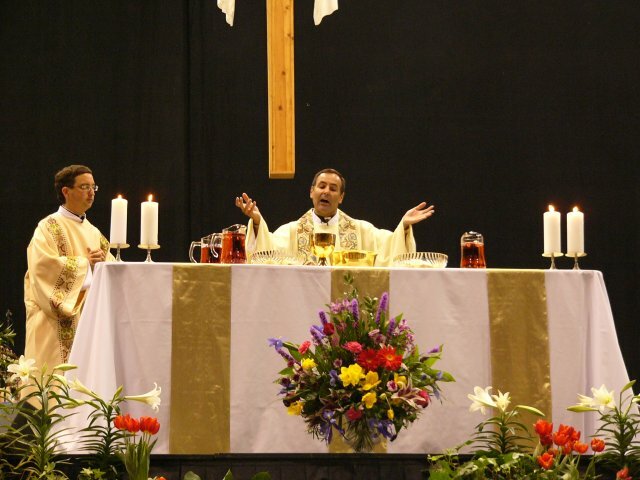 Extraordinary ministers of Holy Communion prepare the feast. 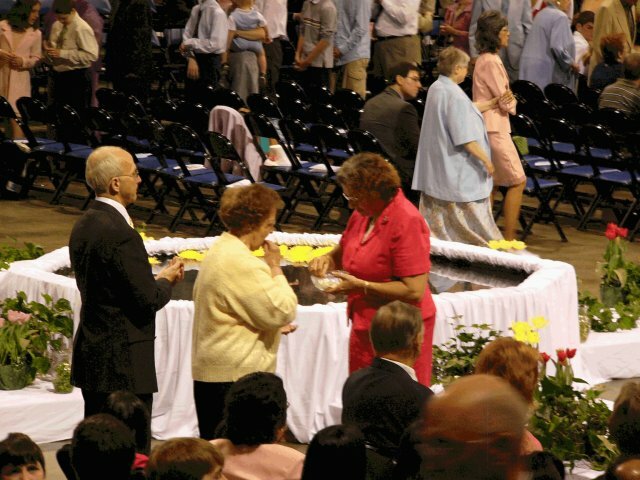 Carol administers the Body of Christ. 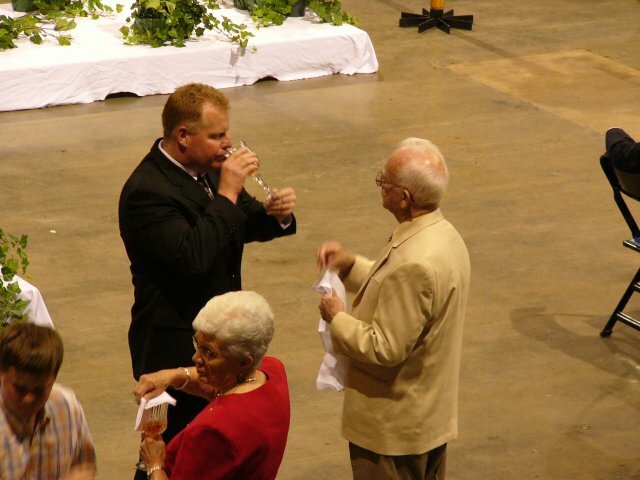 Bob administers the Blood of Christ. Just one of so many beautiful flowers that were displayed by our Art and Environment ministry. 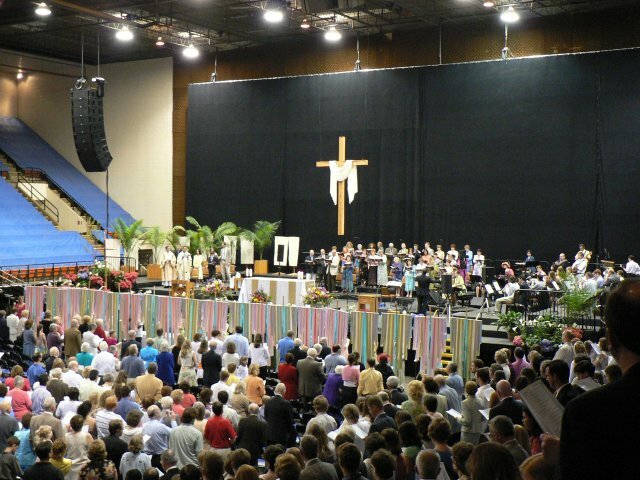 Thanks for all you do to transform this space for worship! 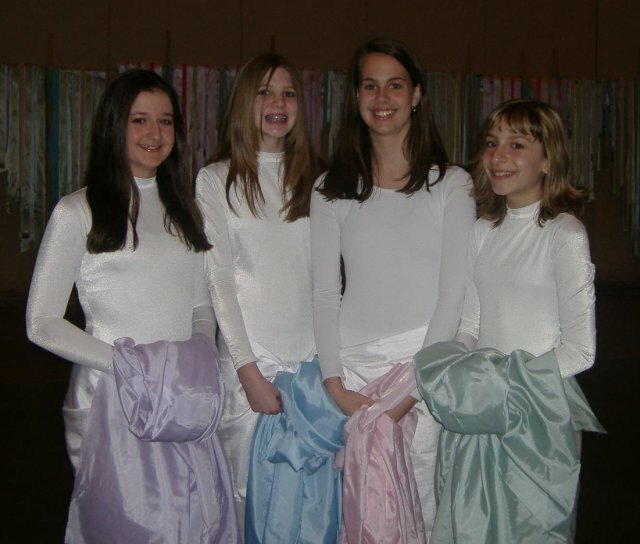 Rebecca, Zoe, Victoria and Lauren share the gift of liturgical dance. Thank You! Banners in procession around font. The music ministry ends our Easter celebration with Handel's Hallelujah Chorus. It was glorious!